What: The Strike Force start their inaugural season on the Illinois-Iowa border against the Steamwheelers. When: Friday, February 22 at 5:05 p.m. pacific (7:05 p.m. central). Where: TaxSlayer Center, Moline, Illinois. 2019 Head to Head: This is the only meeting between the teams this season. Note: The Strike Force come in as one of two IFL expansion teams. The Steamwheelers come in as one of two teams which switched from Champions Indoor Football. The Strike Force are the most recent addition to the Indoor Football League. They were announced as a franchise on November 19. The Strike Force are owned by Roy Choi, who also owns the Cedar Rapids River Kings. The Steamwheelers come into the season after moving over from Champions Indoor Football. They are embarking on their second season of indoor football. Last season in the CIF, they finished 8-4, losing in their conference semifinal game. Strike Force QB Derrick Bernard. 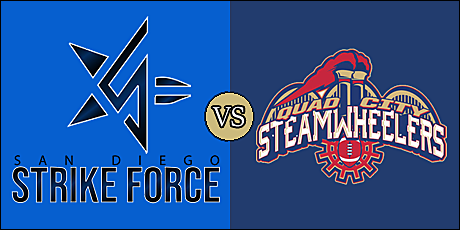 The 2019 Indoor Football League season kicks off with this match up between the expansion Strike Force and the Steamwheelers, who enter their first IFL season. San Diego head coach Burt Grossman has a strong football background in the area, having played for the NFL's San Diego Chargers from 1989 to 1993. He has spend much of his pro-playing career overseeing and aiding youth sports programs. Like Grossman, Steamwheelers head coach Cory Williams spent time in the NFL, most notably as a kick returner for the Baltimore Ravens in 2006. He is entering his second season as the Steamwheelers head coach. He previously served as head coach of the Omaha Beef of CIF. 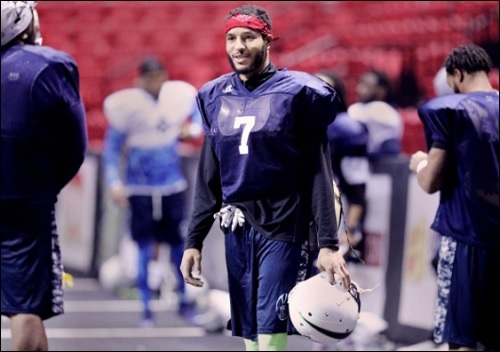 The Strike Force may be the newest IFL team, but they already have a pair of the most experienced quarterbacks in indoor football. One, or both, could provide an impact in this game for San Diego. Derrick Bernard returns to the IFL after having led the Nebraska Danger to the playoffs in 2016. He spent last season with the Champions Indoor Football Salina Liberty last season, in which he tossed 49 touchdown passes. Cory Murphy rushed for 19 touchdowns in 2016 as the signal caller for the Billings Wolves of the IFL in 2016. He also is third in the history of the league with six rushing touchdowns in a single game. Linebacker Mikell Mair also comes over to the Strike Force after a successful 2016 season with the Wolves. He led Billings that season with 56 tackles, three sacks and eight tackles for loss. Wide receiver and kick returner Tray Boone should make his presence known after leading the Bismarck Bucks last season (in CIF) with 553 kick return yards and three kickoffs returned for touchdowns. Several key players return from last season's CIF Steamwheelers sqaud. There is an experienced option at quarterback, with the multi-faceted quarterback, E.J. Hilliard. He threw for 1,994 yards, 48 touchdowns and just five interceptions last season for Quad City. He also rushed for 361 yards with a dozen touchdowns. Wide receiver Quinton Pedroza amassed 392 yards on 25 receptions with 11 touchdown grabs for the Steamwheelers, and figures to be in the mix in his first IFL season. Kenyon Rudd had 417 receiving yards and 10 scoring grabs last season. . On defense, the Steamwheelers look to be paced by a pair of standout linebackers. Shannon Winesbury recorded 60 tackles and eight pass break ups. He also recovered a pair of fumbles and a quartet of pass break ups. 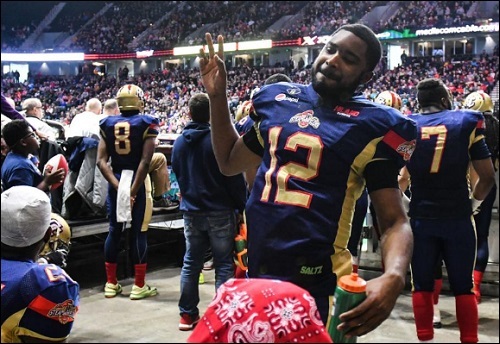 Robert Jones's 12.5 tackles for loss led the Steamwheelers in 2018, and he added three sacks to go along with 46 total tackles. The Steamwheelers' defense forced 38 turnovers last season, while allowing 41.9 points per game. NOTE: Players mentioned in the initial analysis is based on the teams' respective training camp rosters and may not be on the opening day rosters. February 22 - San Diego Strike Force at Quad City Steamwheelers, 5:05 p.m.
February 23 - Bismarck Bucks at Nebraska Danger, 5:05 p.m.
February 23 - Sioux Falls Storm at Cedar Rapids River Kings, 5:05 p.m.
February 24 - Arizona Rattlers at Green Bay Blizzard, 1:05 p.m.
Just a half hour away from kickoff. I'm really looking forward to this one. Are we going to see a rouge?!! Since this is the season opener, there are some special things going on which will probably extend the pre-game a few minutes. Typically 15-20 minutes. The video stream has started. Kickoff coming up. SD is in blue and QC is in white. Derrick Bernard in at QB for San Diego. Complete pass on the first play. Touchdown Strike Force. Derrick Bernard 8 yard run. Ernesto Lacayo kick. FYI: Lacayo was the kicker for the Portland Steel in 2016. Touchdown Steamwheelers. Darius Hicks 2 yard run. Jacob Stytes kick. On a personal note, Heidi has made it to Sparks, and has checked into her hotel. Touchdown Strike Force. Marques Rodgers 23 yard pass from Derrick Bernard. Ernesto Lacayo kick.